Carrying On A Most Hated Tradition With A Slice Of Fancy Cake And…Uh…A Dream? So I’m writing this in kind of a grumpy mood. Selfishly, I’m hoping that writing (which I love) about baking (which I also love) will cure my blues. Sorry, world. Please accept my apologies for the emotion that is about to follow. Also, if any of you deem this to be “too real,” I invite you to please scroll down to the pictures and recipe. Those will kind of rock your world. Now, as for the rest of you, boy are you brave. Okay, yes, I have been feeling quite down lately. That most hated tradition I mentioned? That would be my now-apparently-annual trip to the emergency room. I obviously haven’t croaked or anything, so I’m fine in that respect. But, this year’s trip meant crying alone in an unfamiliar place while hooked up to an IV, flying high on morphine and asking everyone around me who this Dr. Unna-sing whose name was emblazoned across my ID bracelet was (I later came to find out it said “Dr. Unassigned” which should give you some indication of how rough an experience that really was for me). Fortunately, a follow-up appointment and minor procedure revealed all to be well. If anything, I think the “minor procedure” may have made my boyfriend’s week, as it produced a few mortifying pictures and videos of me lying on an examination table and muttering like a blithering fool due to the amount of anesthesia I’d been given. Life. Life is…life. Stamos, dare I bow down to you now? Will that simple act end all of this tragedy? This is here to reward you for reading all of that. Thank you. Bless you. Well, I truly do hope someone swings by to answer at least one of the above questions, because I have a case of the sads, and the only cure is answers. Oh…wait…answers…and cake. 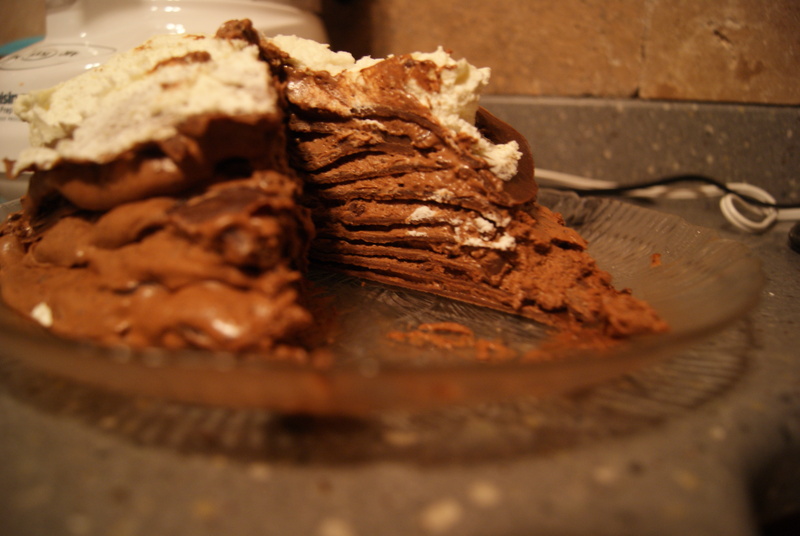 Chocolate Mousse Crepe Cake, to be very specific. Set aside a few hours and wear the ugliest smock you own for this thing. It will all be worth the mess (Note: this is the same thing I tell my soul). Oh, I played around with this recipe a lot, and adapted from here, here and here. Mostly. Kind of. You want to just do this thing? To begin, place all of the ingredients for your crepe batter into a blender and process until completely smooth. Refrigerate batter for at least an hour, and no more than three hours. While the batter cools and firms up, we can work on our chocolate mousse. For the mousse, place the chopped chocolate and butter in a glass bowl and set it over a pot of simmering water. Stir with a wooden spoon until melted and smooth. Remove the mixture from heat and allow to cool slightly, then stir in egg yolks, one at a time, until fully incorporated, and set aside. 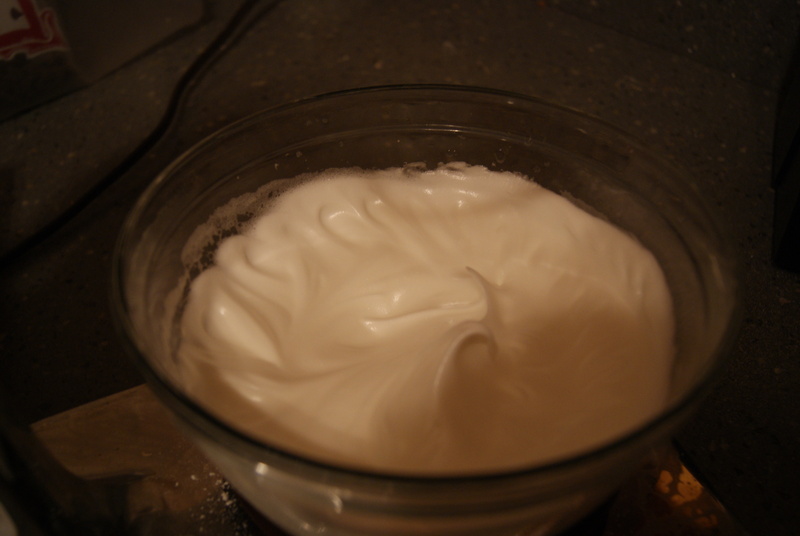 In a separate bowl, beat egg whites using a hand or stand mixer until foamy. Gradually add in 1/4 cup of the sugar and keep beating until stiff peaks form. The peaks should basically be so stiff that you can turn the bowl upside down without worrying about any of the whites spilling out. This takes time. Please don’t do what did and try to show off by flipping the bowl over too soon. Confidence is always key, over-confidence is foolish and humiliating. And now (yep, lotsa bowls, hope you have a dishwasher or love the smell of Dawn dish soap on your dainty hands) in a chilled bowl, whip the heavy cream until it begins to thicken. 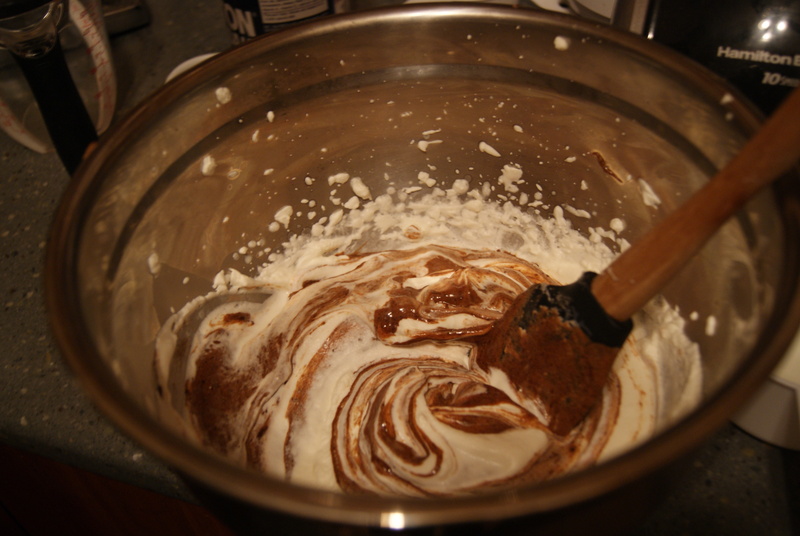 Add in the remaining 2 tablespoons of sugar and vanilla, and beat until the cream forms soft peaks. 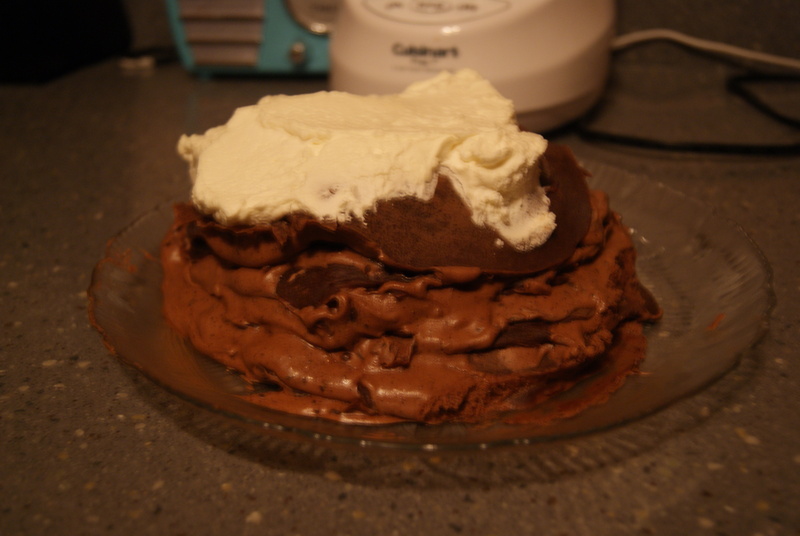 Gently fold the egg white mixture into the chocolate mixture, then carefully fold this into the whipped cream. Don’t overwork the mixture, as it will start to become heavy and soupy. Cover your perfect, light mousse and refrigerate until ready to use. Let’s now move back to the crepes. I should tell you all that I’ve made regular crepes for breakfast on several Saturday mornings, and have, without fail, screwed up at least the very first couple of crepes. I believe my issue is extreme impatience. I never wait for the pan to get hot enough before pouring the batter in. So, you know, not being me is key. Now, heat a lightly-greased 8-inch crepe skillet/regular skillet. Then pour two tablespoons of crepe batter into the pan and swirl around until the batter looks paper-thin. When the top looks dry, flip and cook for another 20-30 seconds. Repeat these steps with the remaining batter (greasing the pan again if necessary). Allow to cool completely. We’re pretty much almost done here, I swear. Once your crepes have cooled, it’s time to assemble this cake. 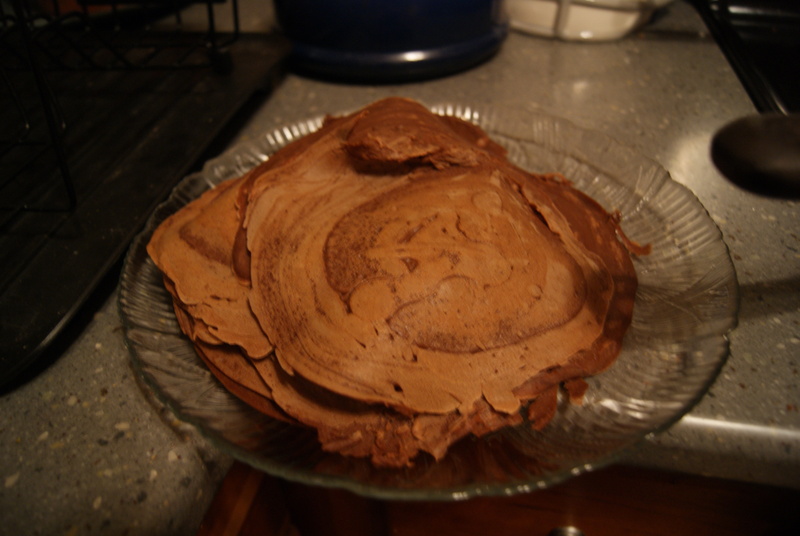 Lay a crepe down on a cake plate, then spread a healthy amount of mousse over it. Top with another crepe, then top this crepe with more mousse, etc., until you reach the top of the holy mountain of good-God-nessness. You can top this with homemade whipped cream (which I highly recommend) if desired. Refrigerate until completely cooled, at least four hours, and preferably overnight. I know, I know, it’s kind of really ugly-looking right? Well, as you all hopefully know by now, I’m no artist. 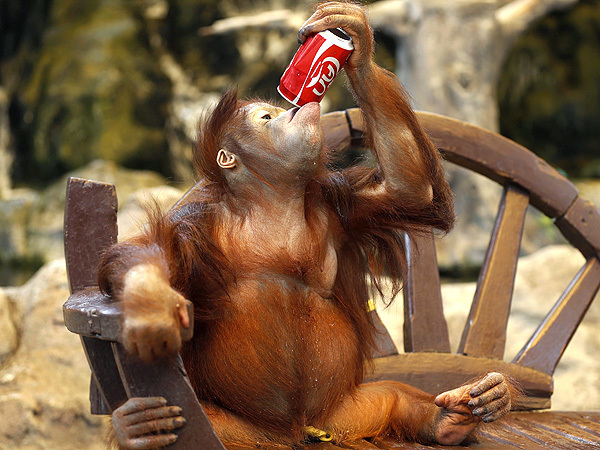 But let’s talk about what really matters here…how’d it taste. Sweet mother. It was a day in heaven with a clean bill of health, a thousand happy elephants prancing around on a sandy beach and everything else that you could ever imagine as being part of your best day ever. This thing was worth every minute of every hour I spent working on it. Believe me, if you are looking to impress, look no further than this cake.